As I reported in my International New York Times op-ed a couple of months ago, France seems to be loosening up when it comes to defending its language. The latest historic moment is the naming of the first foreigner to l'Académie Française, that august defender of the French language since 1635. In recent years a few Frenchmen born outside of France have been named to the this very private club, including perhaps most shockingly, an English-born poet, but Dany Laferrière, born in Haiti, and a Canadian citizen, is the first non-citizen of France awarded the post. France's minister of culture, Fleur Pellerin, signaled this openness in March 2015 speech in which she pointed out the there are more French speakers outside of France than in it, so it nice to see to substance put behind the talk. 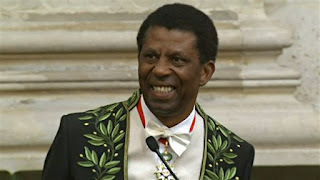 We wish M. Laferrière bonne chance in his new post. We don't have to wish him bonne santé, because the 40 members of the academy as call les immortels. Time will tell. 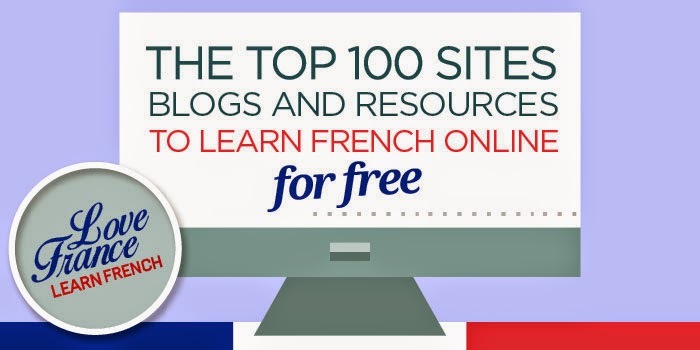 When I first heard that this blog had been included in a list of the top 100 French learning websites, I have to confess, my first reaction was, "There are a hundred French language sites?" 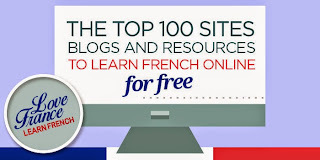 Well, there are, and lots more, and actually I'm honored to be included in Love Frence, Learn French's list of free French-language learning sites, because I'm the only learner blog included -- the other 99 are websites and blogs from French teachers. And I can only hope that my presence makes them nuts. Anyone, Love/Learn French's list is a terrific resource for any cheapskates trying to learn French -- I didn't know about most of the sites on the list, and the blog author, Ryan Harrison, has included nice little capsule descriptions of each. About this site Ryan writes, "He blogs about France and learning French but doesn’t give any lessons to learn the language. He is very interested in current affairs. The site has some reviews of paid online software you can read too." But I'm in some good company, include resources maintained by legitimate enterprises like The College of William and Mary. So go learn some French! 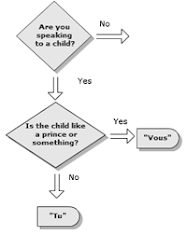 Or should we say, Apprendez-vous quelques française! Or something like that. In my book, Flirting with French, I try to figure out the French kissing business - by which I mean, the bise, "that cheek-to-cheek air kiss, where you touch cheeks and make a smacking sound with your lips as if you were actually kissing, which in most cases you are not, then repeat on the other cheek. And it doesn’t always end there. 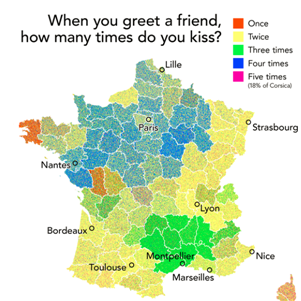 The French, it seems, are so fond of the kiss that they sometimes go for three or even four, depending on the region. In general they kiss twice in the north, and anywhere from three to a tongue down your throat in the south"
So imagine my delight to find, on a UK web page that is reviewing Flirting, to find a map -- yes, a map! -- that goes beyond my "general" guide and indicates how may times you kiss. My question is, is it tongue in, um, cheek? Read the full article at Culteratheque.